You know, it’s funny what isn’t said. 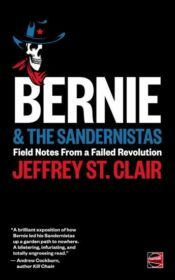 The next president of the United States, upon the 2020 election, is overwhelmingly likely to be Bernie Sanders – things being what they are today and are likely to be in a few years. The only real question at that level is who will be the Vice President? Tulsi Gabbard? Nina Turner? Who in the Republican or Democratic party could beat Sanders on the second go around? His name recognition is massively increased, to say the least. His political popularity is unmatched, by far. His ability to raise funds is proven. Speculation about who the Democrats will run as a viable candidate other than Sanders is beyond absurd. It’s beyond stupid. It’s sheer deceit. There is only one reasonable question in this regard and it is severely frowned upon being asked publicly because it gives the game away, the pathetic little corporate game: How on Earth could the Democrats come up with a candidate to compete with Sanders? They can’t. As far as can be seen. Or, at this point, even imagined. Given the need, increasingly in the age of social media, for genuine popular appeal, such a candidate would have to outflank Sanders on his left, believably, and the Democrats in no way are willing to support any such thing. So it’s Sanders obviously. And yet it isn’t said. Not really, or not at all, not yet. They’ll put it off as long as possible. Just as Sanders puts off the question of whether or not he will run for President in 2020, saying it’s too early to consider it. Of course he will run. And of course he is overwhelmingly likely to win. And win two terms. His age? He’s a tough guy. People may be asking him how old he is for the next two decades. The Republicans will counter with whom? Trump? Shmump. Pence? Whence. Mark Cuban? He would at least give the Republicans a semblance of a chance, but Cuban isn’t as smart as he thinks he is. If he were he would be trying to outflank Sanders on the left, and he’s not. It’s not that Cuban is dull. It’s that he seriously thinks his half-lit room is brilliant. Cuban’s brilliance, such that it is, is narrow, technical. Sander’s brilliance, such that it is, is much more broad, national, if not global. A Sanders Presidency would be the best thing by far, given the alternative of any conceivable Republican or Democrat. This is so obvious that entire corporate industries are devoted to covering it up. Sanders is a flawed political figure, of course. Critics like Jeffrey St. Clair and others have made that clear in lacerating detail. At least Sanders would be a step in a progressive direction. At least it would give the world a chance to pull back from going over the cliff edge of climate change, nuclear destruction, and termination by any number of other horrors. A Bernie Sanders presidential win in 2020 will shift the funny terrain of what is obvious but isn’t said to a higher level, and the possibilities will grow from there. Tony Christini is author of the antiwar novel Homefront, co-editor the Liberation Lit anthology, and mostly recently author of the anti-empire global novel, Empire All In: A Novel of the Trump Era.